On Thursday, December 13, the Kootenai County Court in Coeur d’Alene, Idaho, heard a six-hour, well-argued jury trial that appealed to the public, rather than the government, to defend the civil liberties of a citizen monitoring an Alberta tar sands megaload on Highway 95. Idaho State Police Corporal Ron Sutton accused co-activists Cici Claar and Helen Yost of not wearing safety restraints in a parked vehicle, arrested them for resisting/obstructing an officer, and imposed an inexplicable night in the county jail, when they refused to identify themselves amongst the ExxonMobil police state on Highway 95 on August 26-27, 2011. WIRT’s day in court started at 8:30 am with jury selection from about 30 gathered citizens, as Helen and her defending Moscow lawyer Ben Onosko weighed the odds stacked against them but hoped that a jury could empathize with the shock of sudden imprisonment for no significant reason. Ben worked diligently throughout the trial to help the jury appreciate the precedents for civil liberties violations that they would set by siding with Corporal Sutton, who searched, seized, and jailed vehicle passengers without just cause. On Monday, August 27, at 4 pm, in the Latah County Courthouse (522 South Adams Street, Moscow), Judge John Judge will preside over a jury pre-trial and motion hearing addressing pending charges against Helen Yost for allegedly throwing a protest sign at a vehicle and air-kicking (attempting assault or battery?) in the direction of a police officer, while the last two ExxonMobil/Imperial Oil tar sands megaloads crossed Moscow on March 6. (Hear an interview about the situation between 14:56 and 6:35 on the KRFP Radio Free Moscow March 8 Evening Report, Sign Throwing Charge. At a June 13 motion in limine hearing, attorney Ben Onosko representing Helen argued that the Moscow city laws under which she was cited for throwing an object at a highway vehicle do not define a module hauled on a vehicle but only describe vehicles and people in vehicles, suggesting that her charge be dropped. Prosecutor Rod Hall and the judge countered that Idaho state law clearly delineates vehicles, loads carried on such conveyances, and persons in vehicles and that Moscow city codes are subordinate to state laws. 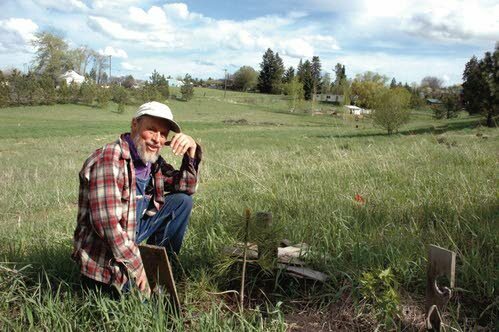 Megaloads protester Jim Prall has started planting a small forest in a hay field on the edge of Moscow (The Lewiston Tribune/David Johnson photo). Two months after being jailed for going into the street to protest passage of oil company megaloads through town, Jim Prall said he’s making amends by planting a forest. More importantly, Prall said while extracting a bit of his tongue from cheek, converting his five-acre hay field to an urban forest will be a lasting reminder that natural resource extraction must be countered by restoration. Prall was among the last three of 11 protesters arrested here during months-long demonstrations against oversize oil company infrastructure loads being trucked through town en route to tar sand fields in Canada. More than 30 demonstrations ranged in size from around 300 people in the beginning down to a couple of dozen toward the end. Prall, who was among those protesting the Vietnam War in the 1960s, initially stayed away from the late-night megaload protests. On Sunday, April 15, two Wild Idaho Rising Tide (WIRT) activists monitored three ExxonMobil/Imperial Oil tar sands shipments from the Port of Pasco, Washington, to Idaho, noting their convoy vehicles, timing and fluctuating speeds, traffic delays and disruptions, and overpass bypass routes. At a second pre-trial hearing on Tuesday, April 17, Helen Yost requested charges as lenient as the sentence of a megaload driver who hit a flagger-diverted vehicle on December 6, for her misdemeanors of throwing a foam board protest sign at the 415,000-pound, last Highway 95 megaload and air-kicking toward a Moscow police officer on March 6. Her lawyer, Ben Onosko of the Northern Rockies Justice Center, will file a motion questioning the definition of a moving vehicle and has scheduled a September trial for both citations. Listen between 9:48 and 2:34 of the April 17, 2012, KRFP Radio Free Moscow Evening Report, Earth Day Awards, to learn more about both situations. On Wednesday, April 11, in Idaho’s First District Court, Judge Robert Caldwell dismissed an infraction for failure to use a vehicle safety restraint imposed on organizer Helen Yost of the Moscow, Idaho-based climate change activist group, Wild Idaho Rising Tide (WIRT). Idaho State Police (ISP) Corporal Ronald Sutton charged Yost with the seat belt infraction and a misdemeanor of resisting and obstructing an officer early on August 27, 2011, when she subsequently refused to identify herself, citing Idaho codes regarding passenger IDs and seat belts in non-moving vehicles (see the attached Early Summary of Megaload Monitor Case). 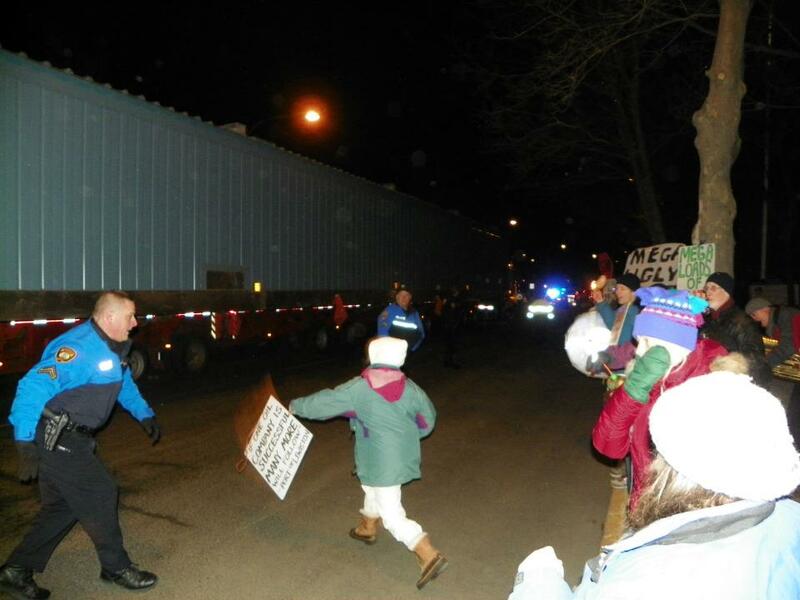 Two megaload protesters pleaded guilty to disturbing the peace for blocking a convoy of Imperial Oil/ExxonMobil shipments in Moscow on March 4, before being given the opportunity to explain how their perception of the environmental devastation tied to the Kearl Oil Sands project left them no choice. Cass Davis and Jim Prall appeared before Judge John Judge in the Latah County Courthouse on Friday, April 6, for their sentencing on misdemeanors of disturbing the peace. Both had peacefully linked arms and sat in Washington Street with Jeanne McHale and Pat Monger, attempting to stop three transports of Alberta tar sands processing equipment from crossing Moscow, Idaho, on Sunday night, March 4. After Idaho state and Moscow city police dragged all four protesters to the side and the two men re-entered the road, Cass and Jim were arrested, jailed, and charged with resisting and obstructing officers. Dana Johnson of the Northern Rockies Justice Center represented both defendants, who ultimately pleaded guilty to reduced charges and, at their open, public, hearing on Friday, read personal statements for the record, describing their reasons for their non-violent civil disobedience. Listen to the Thursday, April 5 KRFP Radio Free Moscow Evening Report, Montana Move to Amend, between 13:38 and 12:42 for their sentencing hearing announcement. Hear Cass Davis’ statement between 28:33 and 22:01 of the Friday, April 6 Evening Report. The transcripts of both Jim’s and Cass’ statements are available at Cass Davis and Jim Prall Sentencing Statements 4-6-12.